In what could be the largest labor-related case since Janus v. AFSCME, policy groups from around the country are expressing support for a lawsuit that would prohibit forced representation from public sector unions. 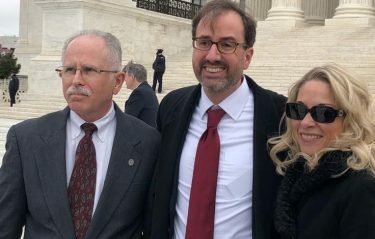 Mark Janus, the plaintiff in Janus vs. AFSCME (left), with Buckeye Institute President Robert Alt, and Rebecca Friedrichs, whose previous case to overturn forced union dues deadlocked the U.S. Supreme Court 4-4, on the Supreme Court steps Monday, Feb. 26, 2018. The lawsuit, litigated by the Ohio-based, free-market Buckeye Institute, received support from 21 different policy groups who filed a joint amicus brief with the U.S. Supreme Court urging the court to hear the case. If the lawsuit is successful, it would allow publicly employed individuals to negotiate their own contracts instead of having their contracts negotiated by a union against their will. Although current law now forbids unions from taking money from non-union members, the unions still have the ability to require representation from the union. The Buckeye Institute is arguing that forced representation violates the First Amendment rights of the workers based on precedent set in Janus. In the prior case, the Supreme Court ruled that forced public-sector union dues were unconstitutional based on the First Amendment right of freedom of association. The Buckeye Institute argues that the precedent should apply not just to fees, but to any form of association with a public sector union. The institute is representing Kathy Uradnik, a political science professor at St. Cloud University in Minnesota. She said that she does not want to be represented by the union because – as a non-member – the union negotiates contracts that go against her interest. Patrick Wright, vice president for legal affairs at the Mackinac Center for Public Policy, said his organization signed onto the amicus brief because the lawsuit could impact seven million public-sector workers. Other prominent groups that filed amicus briefs included The National Right to Work Legal Foundation, Americans for Tax Reform, Liberty Justice Center and the Americans for Lawful Unionism. National Right to Work and the Liberty Justice Center are two non-profits that helped bring the Janus case. The U.S. Supreme Court is scheduled to discuss the case on Feb. 15 and at some later date, the court will announce whether it has decided to take up the case. January 17, 2019 in U.S..